It is the 'One Layer' week and the theme is 'Dreams'. I know not all of us like to make 'one layer' cards but they are my favourite kind of cards. I have had this sentiment from Verve for a very long time and don't get to use it often. So I was happy to see the theme this week. I love this phrase and think we all need to keep that little place in our hearts for those dreams.......but often forget to! The heart stamp from The Ton is stamped in delicata silver ink which is all sparkly IRL. My new mini misti (from hubby) helped me to line this all up. The hardest part of this card was deciding if and what embellishments to add. It just looked too flat without anything. I went with pearls after trying out so, so many other ones. Fabulous card! The sentiment is beautiful. What a fab sentiment, so meaningful and totally perfect for our dreams theme! I love the heart stamp which looks so eye catching and stylish in that lovely silver. Fab card! Thanks for playing along with us at Less is More! Beautiful card with indeed a wonderful quote! Love your onelayercards! Beautiful, love that heart stamp, and the sentiment is fabulous! The card is beautiful from concept to completion!! Oh Sandie... this is extremely dreamy!!! LOve that sentiment, and the stamp is gorgeous, too!! 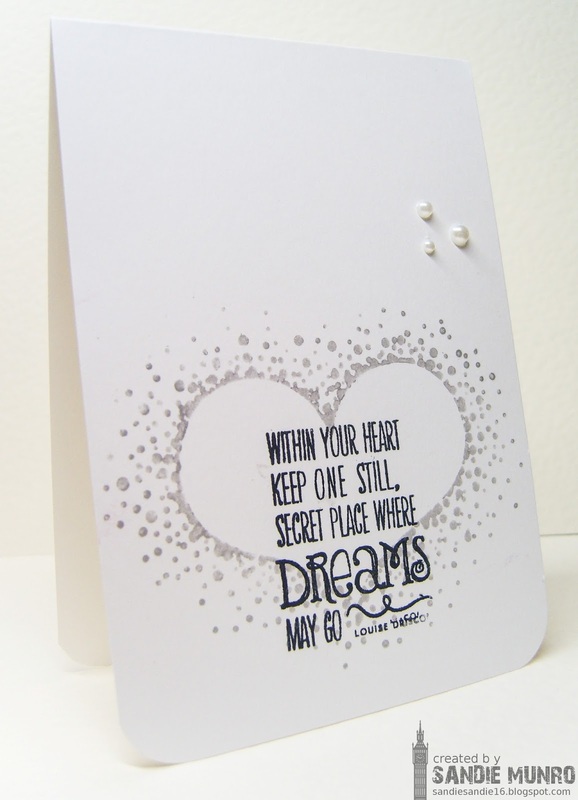 The soft heart, that beautiful sentiment, and the pearls make for a gorgeous card! What a terrific sentiment. Great card! Thanks for sharing at Less is More! Your card is CAS perfection. I really love that sentiment. Wonderful OLC Sandie. I love the design of the heart and the sentiment is perfect for it. Hope you're enjoying your Misti! 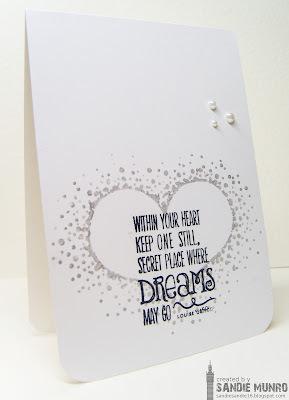 This is gorgeous Sandie... wonderful sentiment and a great one layer card!